The Malama i Ka ‘Aina Award recognizes landscape professionals that promote and aid in the use of non-invasive plants on our island. 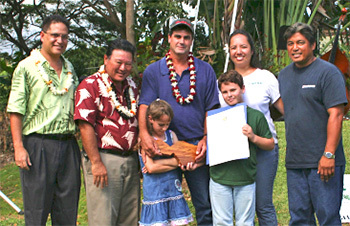 William Jacintho accepted the Fourth Annual Mālama i ka ‘Āina Award on Saturday November 11, 2006 at the Maui Association of Landscape Professional’s Lawn & Garden Fair. Jacintho was honored for the actions he and his family take to keep invasive species out of their nursery and cattle operations and for his efforts to educate students at Maui Community College about pest species. As a specialist at MCC’s agriculture program, Jacintho has a passion for teaching students how to be good stewards of the land. He emphasizes the importance of planting the right tree in the right place and how to avoid planting invasive species in landscaping projects. Jacintho is a fourth-generation farmer who has seen the devastation of what invasive species, such as fireweed and pampas grass, can do to the agriculture economy. He and his family own Beef and Blooms, a split certified organic cattle operation and nursery company, managed by his wife, Anne Marie. Through their company, the family keeps up with lists of invasive species and makes every effort possible to keep pests out of their operations. When asked what other landscapers and people in agriculture can do to Mālama i ka ‘Āina (care for the land), he simply says, the important thing is for everyone to do their part. Prevention is where everyone can help. It’s so simple. I want to encourage all landscapers and plant producers to not plant invasive species. Be proactive and let MISC or Dept. of Agriculture know. Jacintho is also a Certified Arborist and has served on the Maui County Arborist Advisory Committee. The Malama i ka ‘Aina Award is sponsored by the Maui Invasive Species Committee (MISC), Maui Association of Landscape Professionals (MALP) and the County of Maui. The award recognizes a plant provider, landscape professional, or business for efforts to keep invasive species out of Maui County. Mayor Alan Arakawa, Senator Kalani English, MALP President Jeff Bantilan, and MISC Public Relations & Education Specialist, Joylynn Paman presented the award to Jacintho and his ohana.